Regiment/Catrawd: Royal Welsh Fusiliers 1st Bn. attd. 9th Bn. Ref No Grave or Memorial / Rhif cyfeirnod bedd: II. B. 10. Frederick Sheriff Roberts was the last of the Robert’s boys to die in the conflict, please click on the links to read the other brother’s stories. His brothers were Alan Sheriff Roberts and Henry Sheriff Roberts. According to the 1911 census, Frederick Sheriff Roberts was age 12 when that was recorded, and the 4th son of John Sheriff Roberts and his wife Lydia, although by that census they had lost 3 children. Frederick was born in the March Quarter of 1899 and his family history is the same as Alan Sheriff’s, appearing, like Alan on his first census of 1901. Frederick Sheriff Roberts in the UK, Soldiers Died in the Great War, 1914-1919, confirms his regimental details and that he was attached to the 9th Bn., with the date of his death, when he was killed in action on the 28th August 1918, just a little over 2 months from the Armistice. Frederick Sheriff Roberts in the England & Wales, National Probate Calendar (Index of Wills and Administrations), 1858-1966 – Roberts, Frederick Sheriff of the Gables, Curzon Park, Chester second-lieutenant Royal Welsh Fusiliers died 28th August 1918 in France. Administration Chester, 3rd February1919 to John Sheriff Roberts Wine Merchant. Effects £1171 9s 8d. Frederick Sheriff Roberts in the England & Wales, National Probate Calendar (Index of Wills and Administrations), 1858-1966 – Roberts, Frederick Sheriff of the Gables, Curzon Park, Chester died 28th August 1918 in France. Administration Chester 14th December 1925 to Arthur Lyle Birch, Solicitor. Effects £1176 1s 11d – Former Grant D.R. 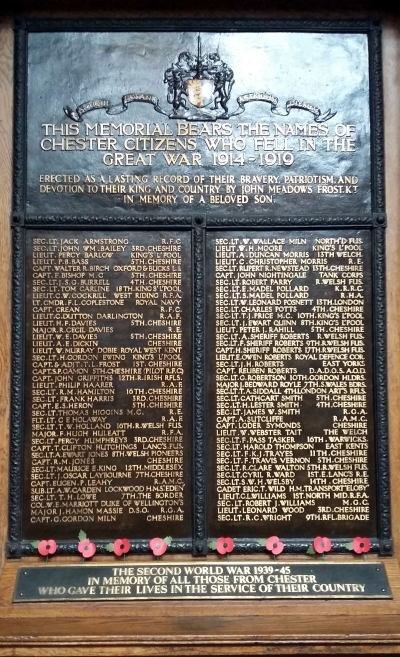 Chester February 1919. – It took about 6 years to get his affairs in order. I cannot find any Army Service Papers for him, nor a medal card, so I do not have a lot of information about his Army career, any information would be gratefully received. This is what is written about Frederick in St Bees School Roll of Honour Book. Second-Lieut. F Sheriff Roberts was killed in action on August 29, 1918. He was at Grindal House 1913-15, leaving at the age of seventeen to enlist in the Royal Welsh Fusiliers. 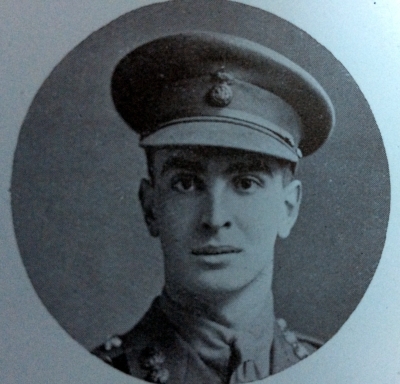 When old enough, he passed into Sandhurst, and was gazetted to the 1st Royal Welsh Fusiliers in December 1917. After being in Ireland for some time, he went out to France in June 1918, attached to the 9th Royal Welsh Fusiliers. He and his company commander were shot by snipers while on reconnaissance work, and killed instantaneously. He was only in his twentieth year. He kept wicket for the XI. 1914-15.